What is Monster Import energy drink? Monster Import is an 18.6 fl.oz can of energy drink that is different from the other Monster energy drinks because it has a resealable cap for ease and so that you aren't forced to drink the can all in one go. It's also a different blend than the other flavors in the Monster range. 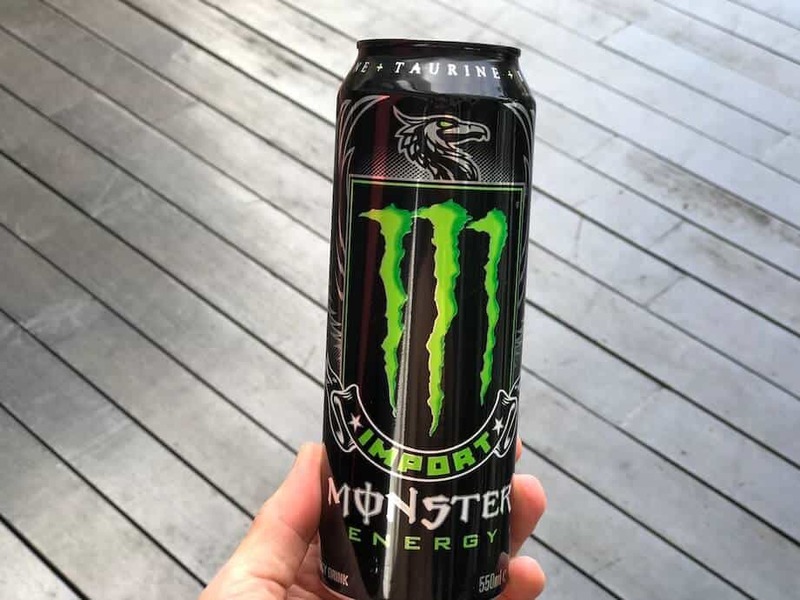 Monster Import contains 179mg of caffeine, which is a very high amount of caffeine for a drink, perhaps a little bit more than your average energy drink. It also contains a whopping 190 calories, as well as 49g sugars. Monster Import is the same flavor as regular Monster, with a couple of key areas adjusted, such as a slight increase in vitamins and a decrease in sugar. Where is Monster Import energy drink made? The drink is made in the USA, as is the can now. Monster Import was initially designed for release in the UK/Europe, but in different size variations. It also comes in the sizes 18.6 fl.oz, as well as the regular 16 fl.oz. Monster Import is pretty much the same as regular Monster except for the fact that it comes with a resealable top! 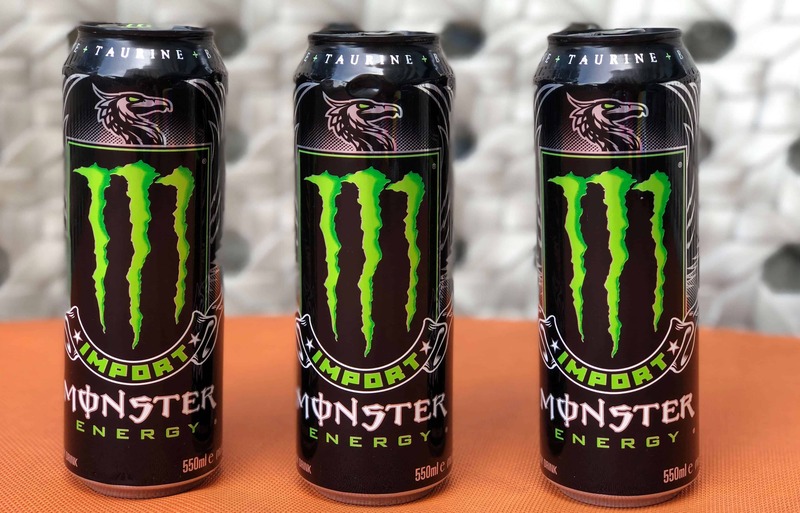 The ingredients in bold at the bottom are part of the special 'Monster Energy Blend' that is present in all energy drinks under the Monster brand, such as regular Monster Energy and Monster Assault. Monster Import energy drink contains 179mg of caffeine, the exact same amount as a regular can of Monster. This is almost half of the daily limit of caffeine consumption- 400mg, so it is not advised that you should drink more than one of these per day. As usual, Monster is a drink with a lot of caffeine alongside sugar. If you do drink this, make sure you also keep aware of what other drinks containing caffeine that you are consuming, or else you run the risk of a caffeine overdose. As usual, pregnant women or those who are breastfeeding should not consume this drink, and neither should children under the age of 18, or those who are very sensitive to caffeine. Monster Import may have slightly less sugar than a regular Monster energy does, but that doesn't mean it's good for you! A pack of 12 Monster Import energy drinks that each contain 18.6 fl.oz costs around $37.95. This means that a single can of Monster Import costs $3.16 per can. This is a pretty good price, considering that it's a much bigger can, and has a generally bigger volume of drink compared to the regular Monster can. The resealable top is also a positive factor here, as this means that you aren't forced to drink the whole thing in one go, but you can take your time with it! If you're not a fan of the price or the high sugar and caffeine content in Monster Import, check out REIZE, which is a powder energy drink that ships directly to your door for around $1 per drink. You can get Monster Import on Amazon, and it comes in packs of 24. I would say be careful if you're thinking of buying a pack of 24, because if you don't like the taste, you're stuck with your choice for a really long time and might have to resell it yourself. Make sure you like the taste first before investing in a such a huge amount of drinks. You can also get it at Energy Drink Outlet, which gives you a bit more choice as to what you want to do with the drink- add it to a mix & match pack, buy a smaller pack of 8, or a single can. It's up to you. You can also get it at physical stores such as Walmart, Target, Costco, and most gas stations in the US. Monster Import contains 179mg of caffeine per 18.6 fl.oz can, Monster is similar, with 179mg of caffeine / 16 fl.oz. No difference here, except for the size of the can. Monster Import and regular Monster have the same amount, but Import is a slightly bigger can- this means that there's less caffeine per fl.oz than there is in a normal Monster energy drink can. This is more or less the same amount of sugar, and both drinks use the same artificial sweetener, which isn't that great. Monster Import is slightly less sweet than regular Monster, and it is slightly bigger than a regular Monster, so it's just less sweet overall. Might be more appealing for those who think that Monster is too sweet for them. A single 18.6 fl.oz can of Monster Import costs $3.16, while it is $37.95 for a 12 can pack of Monster Import energy drink on Amazon, which means that it's around $3.20 for a can, excluding shipping. This was pretty surprising for me, given that Monster Import is bigger and has a fancier can. Monster Import is slightly less expensive than regular Monster, but the difference is only a couple of cents. What a pack of 12 Monster Import cans looks like when it arrives. Monster Import contains 179mg of caffeine per 18.6 fl.oz can, while Red Bull only has 80mg of caffeine / 8.4 fl.oz. Red Bull has half the amount of sugar than Monster Import does, but it does come in a smaller can. Two cans of Red Bull would be equivalent to a single Monster Import's caffeine content, but not quite the same amount of fluid ounces! Monster Import contains 49g of sugar, and Red Bull contains 26g of sugar / 8.4 fl.oz, half of that of Monster Import. Even though Monster Import is not as sweet as regular Monster Energy, Red Bull is still only half as sweet as Monster Import, making it slightly better. 26g of sugar is still over the recommended daily sugar limit though (25g for women, 38g for men). A single 18.6 fl.oz can of Monster Import costs $3.16, while Red Bull only costs around $1.99 per can. If we're talking about value for money, then Monster Import has more value, because it only costs a dollar more for the 18.6 fl.oz, while Red Bull is 8.4 fl.oz and is $1.99. Monster Import contains 179mg of caffeine per 18.6 fl.oz can, and Bang has nearly double that at 300mg of caffeine / 16 fl.oz. Looking at the caffeine content, it seems that Bang would be a lot more effective than Monster Import, but this is only true for those who find caffeine to be the most effective way to get an energy boost. Monster Import contains 49g of sugar, but Bang energy drink has 0g sugar. Monster Import has a lot more sugar, which it also relies on to provide an energy boost, but Bang is "sugarfree", and instead uses a ton of artificial sweeteners instead. Monster Import also uses the artificial sweetener sucralose, so neither drink is very healthy in this respect. A single 18.6 fl.oz can of Monster Import costs $3.16, while Bang costs much less, at $2.17 per can. Considering that Monster seems to be so much more expensive, it should be more effective right? Not exactly- it depends on your individual body chemistry. Monster Import has gotten an upgraded look from regular Monster, in the form of a fancy new crest. Monster Import contains 179mg of caffeine per 18.6 fl.oz can, while REIZE only has 50mg of caffeine. Even though REIZE has so much less caffeine, it makes up for it by having 1000mg of taurine, an organic substance that has been known to produce good, clean energy. Monster Import relies on caffeine and sugar, both of which aren't very helpful to the body in the long run. Monster Import contains 49g of sugar, and REIZE is completely sugar free. Monster Import uses sucralose, which does come with potential side effects, and not much research has been conducted on it as of now. A single 18.6 fl.oz can of Monster Import costs $3.16, while REIZE is a lot cheaper, at only around $1 per sachet, which can make a 8 fl.oz drink. If you're looking for efficiency and ease to carry around, REIZE is a great choice because it comes in small, light and easy to transport packets as opposed to the massive behemoth of the Monster cans. Pretty cool, looked the same as a regular Monster can. What intrigued me was the top of the can- it was black rubber (plastic? ), but one thing I was rather confused about was which way to turn the top. It would have helped if there was an arrow or something to show the direction- how many people must have accidentally broken off the top while trying to get it open? The can itself was literally as tall as my face as well, which was really amusing. Besides that, the design was more or less identical to the regular Monster can except for a few fancy embellishments. Definitely less sweet than regular Monster or even Monster Assault, but it has quite an unpleasant aftertaste because of the sugars, I believe, as it tasted like I had eaten an entire spiced clove. It also tastes pretty much like the regular Monster, and with a slightly more sour taste. Definitely felt like I had to brush my teeth after drinking it though! If you're looking for something with a lot less sweetness, try out REIZE, which definitely does not have as much sugar as Monster seems to have. Again, not very much different from the other drinks in the Monster energy line- its effect on me was the same as the other drinks, it gave me a pretty good energy boost without making me too jittery, but there was also the inevitable sugar crash a few hours later. I also tested the spill-proof can itself (safely over a sink, of course). I shook the can with the resealable lid closed, and nothing came out, and even upturned the entire can to see if anything would leak out, but I was really impressed to see that it really is as they say- spill proof! Personally, I give Monster Import a 6/10. Monster Import has been described as having a crisper, less sweet taste than regular Monster, and if you want to check out some other reviews, have a look at these. This review gives a more general overview of taste and effect, as well as the effectiveness of the can itself, which is pretty impressive! Another review here is on Monster Import Light, which is useful if you want a lighter, less sweet version of the drink- but watch out for artificial sweeteners! If you want something that goes a bit more into the ingredients and their amounts, go ahead and check out this review, which goes into depth, as well as how the new size affects it. Overall, I give Monster Import a 6/10. The taste was sweet but not as sweet as the regular version of Monster, and I think that the spill proof can is really quite impressive. I personally haven't seen a can like this before, but apparently it's quite common in places like Amsterdam (where the Monster team got the idea from), so this might not be as surprising to people who live there. The effects were also as to be expected, and the larger size of the can means more value for money at $3.16. However, I have to say I'm still concerned about the really very high levels of caffeine and sugar in the drink, so that's what's holding me back from giving this drink a higher rating. You could also take a look at Vivarin caffeine pills if you are looking for something that's quick and easy to take. At 200mg of caffeine, it's around the same amount of caffeine that Monster Assault has, but without the great taste. Of course, there are also loads of other caffeinated products out there that you could turn to for your energy needs. Something like Make It Mio immediately comes to mind. With 50mg, REIZE contains a lot less caffeine than Monster Import Energy, but it does contain plenty of other great energy-boosting ingredients that are healthy for you. REIZE is a lot more convenient and versatile, since you can add all types of liquids to it- soda, hot water, cold water, flavored juice, it's up to you. REIZE ships right to your door for around $1 per drink, cheaper than most of the energy drinks on the market - including Monster Import.